To treat farsightedness, the flat cornea is made steeper by removing tissue outside of the central optical zone of the cornea. This moves the point of focus from behind the retina to directly on the retina. Treating farsightedness, the cornea is made steeper. 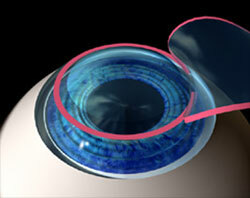 Treating astigmatism, the cornea is made more spherical. You will arrive at the clinic about a half hour prior to your procedure. Once you have been checked in you may be offered a sedative to help you relax. You will then be prepared for surgery. The area around your eyes will be cleaned and a sterile drape may be applied around your eye. Anesthetic eye drops will be used to numb your eyes; no injections or needles will be used. When your eye is completely numb, an eyelid holder will be placed between your eyelids to keep you from blinking during the procedure. a sterile drape may be applied around your eye. Next, an instrument called a microkeratome will create a hinged flap of thin corneal tissue, and your doctor will gently lift the flap out of the way. During this process, you may feel a little pressure, but no pain. You will then be asked to look directly at a target light while the laser reshapes your cornea. The Excimer laser will be programmed with the information gathered in your pre-operative exam. The laser treatment will be completed in usually less than a minute, depending on the amount of correction needed. To finish the procedure, the hinged flap will be folded back into place where it will bond without the need for stitches. 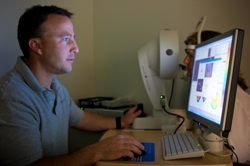 Following your procedure, your eye(s) will be examined with a slit lamp microscope. Then you will be given additional eye drops, and y our eyes may be shielded for protection. Your vision will probably be a little blurry at first, so someone will need to drive you home. You should relax for the rest of the day. You may experience some discomfort for 12 to 24 hours, but this is usually alleviated with an over-the-counter pain reliever. Some people experience sensitivity to light, and watering or swelling of their eyes for a few days following their procedure. Following your procedure, your eye(s)will be examined with a slit lamp microscope. You will be asked to come back the next day for another examination of your eye(s). 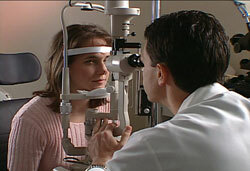 Most people can actually see well enough to drive the next day but it’s best not to drive until you have been examined. You should be able to resume most normal activities the day after surgery. Contact us at 800-531-EYES (3937) to schedule an appointment and find out if Laser Vision Correction is right for you. We offer a number of finance options and affordable payment plans. It is easy to apply on line and receive credit approval before you schedule an appointment.